Robert Galea is a Catholic seminarian from Malta who will be ordained to the Priesthood this November 5th, 2010. Please keep him in your prayers. The Responsorial Psalm of today‘s Mass reminded me of this simple song to the Holy Spirit, a reminder that all is created by a higher power than ourselves. If we deny this truth, we ultimately run the risk of giving control of our lives to mere human beings and human structures, rather than rely upon the Lord of Life who endowed us with our very being. By your Spirit, Lord, the earth is full. Bless the Lord, my soul. Lord God you are Great! By your Spirit, O Lord, the earth is full. and fades away into the earth. Your glory, O Lord, exists for ever. God rejoices in His creation. show me your untiring love. in my being in You. a new desire to live. scourge the depth of our heart. The Holy Spirit Prayer is written by a Canossian Sister. All rights reserved. These words for Augustine are thought after living a life involved with much pleasure seeking, trying like many young people today, to find his happiness in what the society of his day offered. He had a live-in girl friend, he partied, and had a child out of wedlock. He was educated at some of the finest universities of his day, and was recognized as an intelligent young man. He allowed his ‘wisdom’ to get the best of him, and fell into error of the Manichæans, all the while dismissing the Catholic faith of his childhood as being intellectually lacking. His quest for truth was confronted in listening to a sermon by Bishop Ambrose of Milan, noting how the bishop reasoned his case for Christ without contradiction. This won the young Augustine to question more deeply the faith of the Christian life under the instruction of Bishop Ambrose. The Confessions is a book in which Saint Augustine describes this process of coming to know himself through reconciling his understanding of God, and how that reconciliation led him to give his life in service to God and His Church. May we today live these words of Saint Augustine, and may we too ‘hunger and thirst for more’, and find ourselves won over by God’s immense love. Our society has lost the art of gratitude, that capacity to turn and give thanks to those who make a difference in daily life. We are called, however, like the one cleansed leper returning to Jesus, to render thanksgiving to God. Not so much because God has answered a need (healing, job found, relationship issue resolved), but more so because we understand by our action of giving thanks, we proclaim that we are saved only through the action of God in Christ. 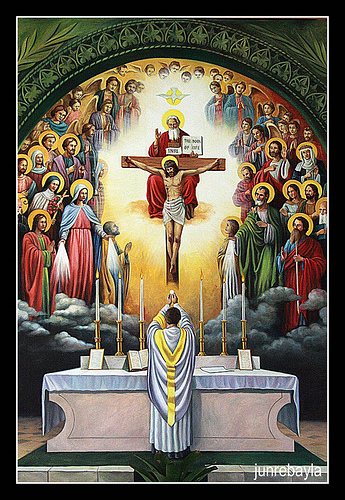 When we celebrate the Holy Sacrifice of the Mass, the center of our worship is Jesus himself in the Eucharist. It is a thanksgiving, as suggested by the Greek noun – εὐχαριστία (eukharistia), the verb of which is “to thank”. And so, with our Lord before us, we recall our successes and favors received during the week. Above all, it is here, we contemplate God’s great love, that becomes real at our own discovery of being saved without payment – freely given. Let us not let this Sunday pass us by without turning to the Lord, and offering him our praise, our thanksgiving, and our love. Immortal Godhead, one in three! In our true native land with Thee. that looked like this: their form was human. like the voice of the Almighty. When they moved, the sound of the tumult was like the din of an army. And when they stood still, they lowered their wings. Upon it was seated, up above, one who had the appearance of a man. he was surrounded with splendor. was the splendor that surrounded him. Such was the vision of the likeness of the glory of the LORD. From a Prayer by Saint Alphonsus Liguori. This and other prayers are available here. With love and benevolence, God unites himself to His people and thus, to each soul. He speaks intimately to each heart, in the silence of the “desert”, away from the worldly clamor. Today, as I celebrate nine years of consecrated life, I am posting a reflection I gave on the eve of my final vows in 2006. Reflecting on my vows three words come to mind that encapsulate the whole of my religious vocation: ‘here I am’. This is the response I gave at the celebration of my final vows on the 3rd of December 2006 when the General Superior, M. Marie Remedios called out my name before the Bishop Domenico Sigalini and the assembly at the Church of St Magdalene Canossa in Ottavia – Rome. It was my response to a call by God to participate with Him in His plan of salvation. God called my name and I responded. All of us are called by God but in various ways. Our Christian life is a life of learning to respond according to the state of life we live: some of us are single; others of us are married with children; others of us are religious and priests. But all of us have the same duty of learning to respond whole heartedly to God. When we open the Bible, we find stories of many who have been invited to follow God, and how they responded. Abraham responded to God with these very words in Genesis 22,1 when he was asked to sacrifice his son Isaac to demonstrate his faith, and in his faithful obedience he became the Father of Nations (Rom 4, 1- 17). Moses too received an invitation by God to lead the Israelites out of Egypt and when called, responded the same way: ‘here I am’ (Ex 3,4). And so also with the Prophet Isaiah when the Lord asked ‘whom shall I send?’ (Is 6,8) Isaiah’s response was ‘here I am, send me’. What is it then to be ‘called’ by God? The word ‘vocation’ comes from the Latin word ‘vocare’ which means ‘to call, to summon, to invite’. Our vocation then – to the religious, singular or married state – is an invitation to live according to the will of God. And how do we know the will of God? This is the journey of each person to discover what God wants of him or her, but it is always tied to the mission of Christ who said, “my food is to do the will of the one who sent me and to finish His work” (John 4,34). The ‘work’ of the Father is redemptive, bringing about liberation for all humanity bound by sin from the time of Adam and Eve. Christ came to fulfill this plan of salvation through His life, death and resurrection. All Christians are called to collaborate in this redemptive work by bringing others to know and love God the Father through Jesus Christ. We too are called to hunger for all to know God through fully living out his will through our love. We learn to share our faith through our experience of God; an experience that is manifested in our life of prayer. Prayer, then, is the key to knowing the will of God. A comedian in the United States was keen of saying ‘you can’t have a relationship with someone you don’t talk to.’ In other words, you can’t have a relationship with God without making time to talk to Him and listen in the silence for His Word. I like to look to Mary as an example: the young girl from Nazareth who listened to God, and her listening prepared her heart to respond when God called her to be the Mother of our Lord, Jesus (Luke 1:28-38). In her example we see the fruit of prayer – a receptive heart ready to do whatever God asked. When I entered as a postulant with the Canossian Sisters in 1998, I began to respond to God in my prayer where I found a desire in me to dedicate my life to service of God. Although the desire existed in me to want God’s will, I struggled constantly with my own desire and wants; I struggled with fears of letting go and failure. These are the struggles of humanity that each of us grapple with. St. Paul spoke of this struggle when he said in his letter to the Romans: “for the good that I want, I do not do, but I practice the very evil that I do not want” (7,19). One of the most important things I have learned in all my years of preparation for my final vows was that despite my sin – doing the things I don’t want – God continues to love me. Our humanity is so used to judging people based on what they do, or in religious circles, how good one is. My experience of God has taught me that despite my weakness, my failure, my small capacity to love as Jesus loves, Christ still loves me and desires me to belong fully to Him. I have found that I will never be perfect or worthy to belong to Christ Himself; but I have also found that God wants me anyway. He takes me as I am and I find that it is His love that perfects me. And slowly, with His grace which flows always through the Sacraments, I am being transformed to be more like Him and more able to love like He loves. This new awareness has prepared me to choose a life of belonging to the One who is Love, with a desire to live my life so to make Him known.